As soon as my friend and I entered the inviting double doors of Boba Theory’s second store, located at Emory Point, I was immediately reminded of coffee shop culture. With dim lighting accompanied by jade green lamps, pots of plants and a table-and-sofa area, the new boba shop serves as both an aesthetic study spot and a place for guests to gather and relax. In the corner, a woman was working away with laptop and color-coded papers spread around her. Parallel to her were students chatting away between classes, sipping on their colorful boba drinks. Boba, or bubble tea, is a tea-based drink that originated in Taiwan and offers a choice of tea mixed with milk or creamer. The key ingredients are the tapioca pearls, also called boba, that sink to the bottom of the cup. These pearls have the texture and consistency of gummy bears, and are a necessary complement to the otherwise light tea drink. Often, they are also steeped in a honey or sugar mix to add a sweet taste. 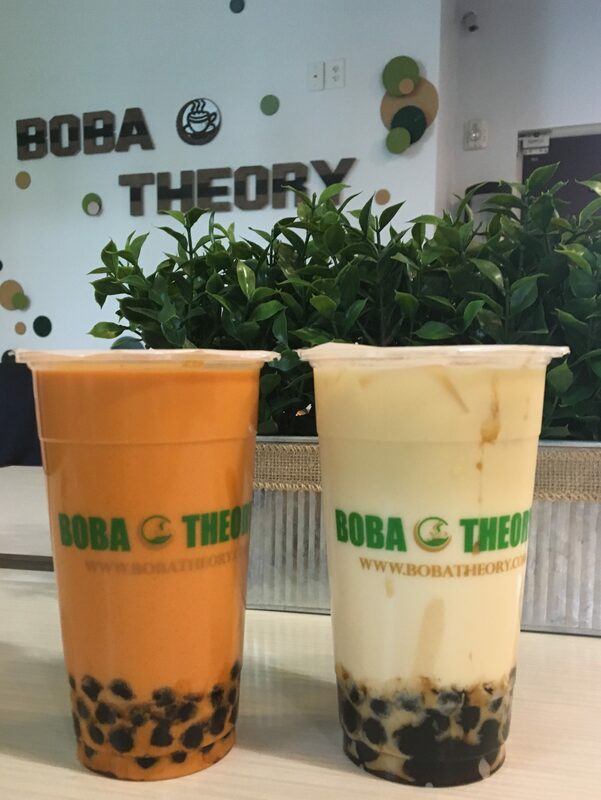 Boba Theory’s menu offers more than 20 milk tea flavors, including traditional flavors like oolong and jasmine, as well as more eclectic flavors like caramel and mango. Drinks also include coffee, and are about $3.75 to $5. In addition, Boba Theory offers a few choices for toppings besides from boba, including lychee jelly, grass jelly and popping pearls. Customers can also customize the amount of sugar and ice in their drinks. All drinks come with non-dairy creamer options, a plus for lactose intolerant boba-holics. I ordered an oolong milk tea with boba at regular sugar and less ice, while my friend ordered a Thai milk tea with boba at regular sugar and no ice. Upon ordering, we snagged a spot at a round table and promptly started a chess game with a provided board. Shortly after, our drinks arrived: mine, a warm hazel color, and hers, a subdued tangerine. After my first sip, a rush of sweetness hit my tongue, followed by the flavor of the oolong tea and the chewiness of the boba. The drink was quite refreshing, though a little too sugary and lacking in tea flavor. I tried my friend’s Thai milk tea as well; it evoked a creamy flavor that was even sweeter than mine. I made a mental note to get half sugar next time. The boba were inconsistent in texture, with some being chewy and others too sticky to chew. Thankfully, none of the boba were too hard to chew. It was likely that the boba had been overcooked or squished together. Overall, this boba shop features some popular flavors from traditional teas, such as oolong and jasmine, as well as flavors from coffee and smoothie shops, like caramel and mango. Like many modern bubble tea shops, it seems that Boba Theory attempts to combine the cultures of both American and traditional Taiwanese desserts. Though the drinks themselves could be improved with stronger tea flavors, more consistently chewy boba and a more robust profile, Boba Theory offers an atmosphere that feels like home away from home. The shop will make a great addition to Emory that is within walking distance, especially since most of the popular spots are located on Buford Highway.